Catch the speeding race car! 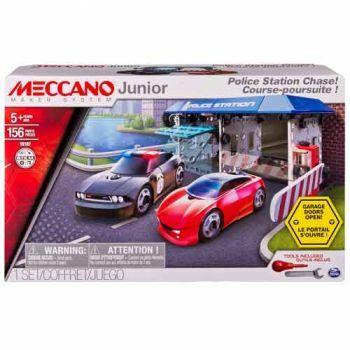 Your child will enjoy hours of fun building, then reporting for duty with the Meccano Junior Police Station Chase! Using the classic Meccano construction system and easy to follow instructions, kids can build a police station featuring real working garage doors, a police cruiser and race car. Once built, imaginations will take off as the red sports car speeds away and the police officer goes in hot pursuit to catch him. The Police Station Chase makes learning about STEM (Science, Technology, Engineering and Math) fun and helps support a child's developmental growth. As they use real nuts and bolts to fasten pieces together and discover elements of real engineering; they're also improving hand-eye coordination, fine motor skills, problem solving skills and exercising their imaginations! The Meccano Junior Police Station Chase makes a great alternative to construction blocks for children.